In March, Visit Kent held a Digital Walkshop aimed to explore the various ways visitors use technology. Led by the Digital Tourism Think Tank, participants were divided into four groups representing different types of tourists. For example, the Young at Heart group represented tourists who were older and not as familiar with current technologies. Each group was given three tasks to complete during the day, which started at 10:00am. From an initial starting point of the Marlowe Theatre, each group had to pretend that they weren’t familiar with Canterbury or its cultural and tourism offerings. Instead, groups had to plan out their day as if they really were visiting from elsewhere. The first task for the Young at Heart group was to plan a day out from Canterbury. Many tourists initially plan on visiting one location, but are eager to explore nearby places as day trips. 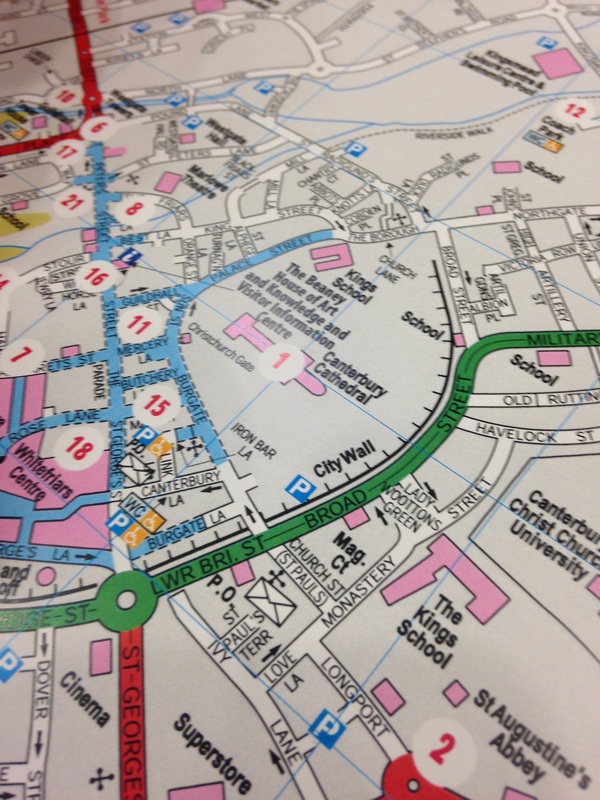 As ‘tourists’ to Canterbury, we had to figure out where to go, how to get there, and whether it was open. We first Googled ‘tourist information Canterbury’ to see what places others suggested to visit while in Canterbury. The results linked us to a directions page, but unfortunately the directions were not available, which was frustrating. We next decided to ask someone at a tourist office or visitor centre in person. We went back to the smartphone to Google maps to see where we were and how far we were from the tourist centre. However, the online map was confusing with too much information appearing, so we quickly looked around High Street and found out that Canterbury has very good signage set around the city, and were able to find the Canterbury Visitor Centre, which was located at the beautiful and historic Beaney House of Art and Knowledge. The visitor centre had maps, brochures and guides on display, offering a wide variety of options for places to see both in Canterbury and nearby towns. We perused the brochures and picked out the brochure on Leeds Castle as it was a nice day and we wanted to visit somewhere outdoors, but we still needed to know how to best get there. Instead of using a smartphone to look up directions, we thought it was best to ask someone at the help desk. She told us that is was not easy to get there if we did not have a car. 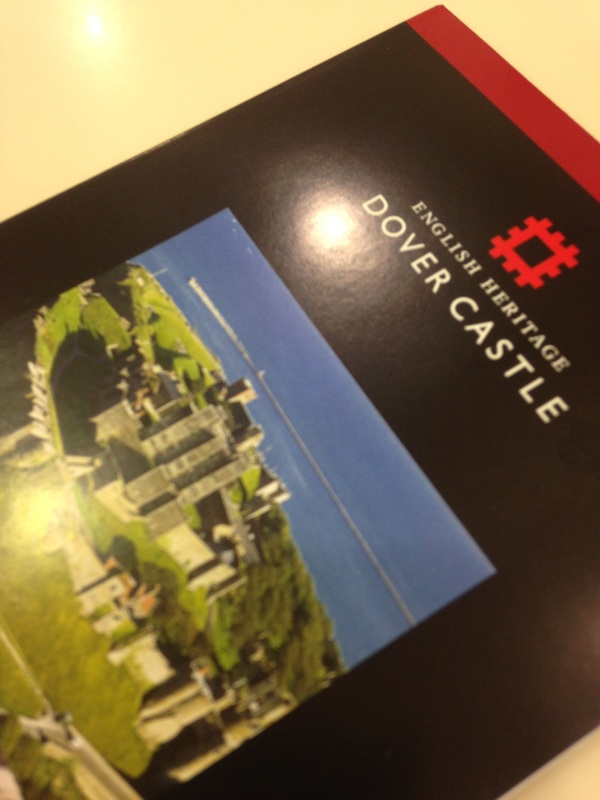 She gave us a brochure for Dover Castle instead, along with bus and train options. The brochure said the castle was open everyday from 10-6, and if we took the bus, it would take us closer to the castle, although there was still a big walk up a hill. She gave us bus options, including how to get to the Canterbury Coach Station where the bus we had to take was located. Along the way to the coach station, we tried to look up bus times and ticket costs but the connection to the Internet was spotty. We found that there was free Internet at Fenwick’s, so we stopped by to check our smartphone. Unfortunately, there were still problems connecting to the Internet, but luckily we saw that the coach station was nearby. After speaking to an employee, who gave us different, but more convenient, bus instructions than the lady at the visitor centre, we decided that visiting Dover Castle was a good idea, and Task 1 for Young at Heart was completed! 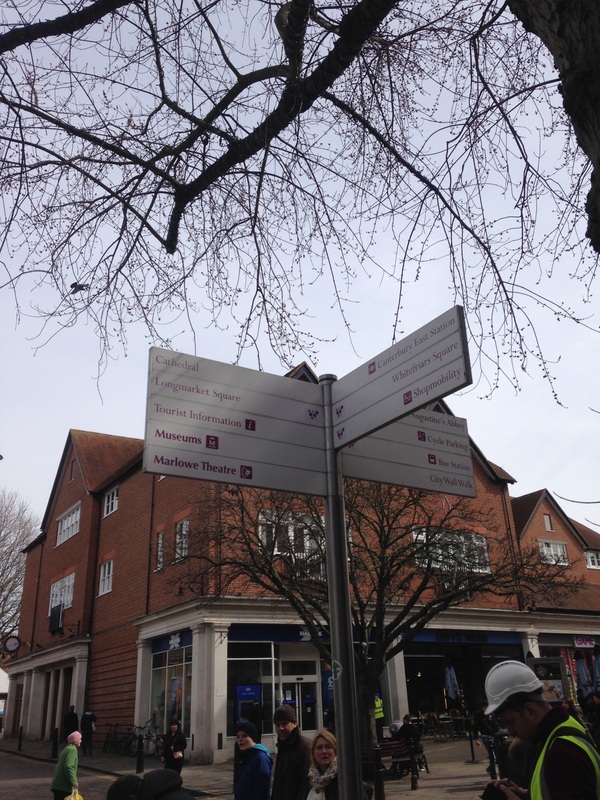 Although this task seemed like a simple one, it proved that it can be frustrating and complicated for those who are not familiar with Canterbury and had to rely on signage, assistance from people, and spotty Internet service. Although many people own smartphones, they provided no extra help when no Internet connection was readily available. Even when the Internet did work, we could not depend on links since they were either not working, or search results were not what we were looking for. Acting like tourists in Canterbury really helped us understand what a tourist might go through when they are visiting a new place and want to experience all that it has to offer, but do not know where to start. While many people do most of their planning beforehand, some may want to take a spontaneous day trip or change plans based on weather. In these cases, they may rely heavily on their smartphones to get information quickly so they can start their day out as soon as possible without wasting much time. Even though speaking with people is helpful, tourist centres might be closed if it’s a holiday or they might be located far from where the tourist is staying. When thinking about how technology can best help tourists, places of tourism need to have reliable, up-to-date information on their websites. If all related data is centralised and standardised using the same vocabulary to tag cultural events, it would make online searches much easier for tourists. This is the main goal of the Culture Kent project. 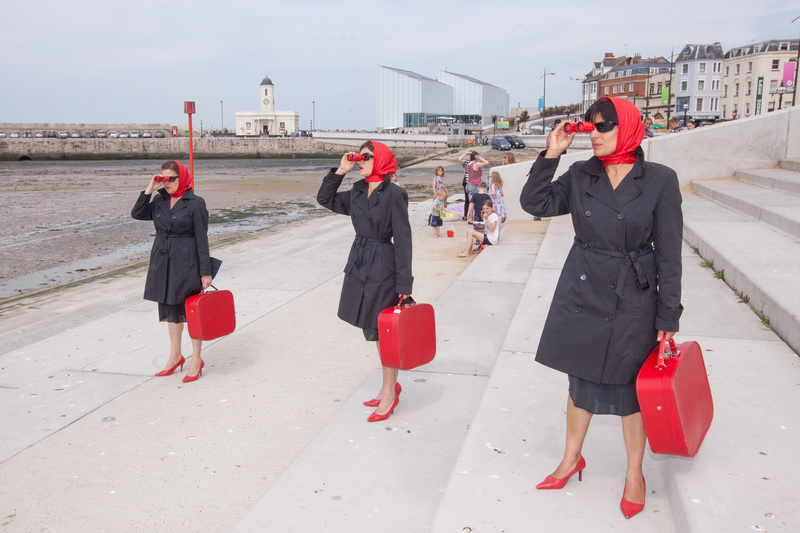 By creating a data pool of all cultural event data in Kent, we can optimise users’ searches, making it easier for future tourists to discover all the cultural events Kent has to offer, and as a result, increase Kent’s profile as a cultural destination. Did you have similar experiences while visiting a new place? How has technology helped you, or would centralised cultural event data have been more useful? Please leave your comments below!